An elevated pier foundation, narrow width, and front and rear porches make this home perfect for waterfront lots, while its squared off design makes it easy to afford. The great room, kitchen, and breakfast area are all open for a casual and spacious feeling. Numerous windows enhance the area's volume. Flexible rooms located at the front of the home include a formal living or dining room and study or bedroom with optional entry to the powder room. Upstairs, every bedroom (plus the master bath) enjoys porch access. The master suite features a tray ceiling, dual closets, and a sizable bath with linen cabinets. A utility room is conveniently located on the second floor. 2nd Floor: 1058 Sq. 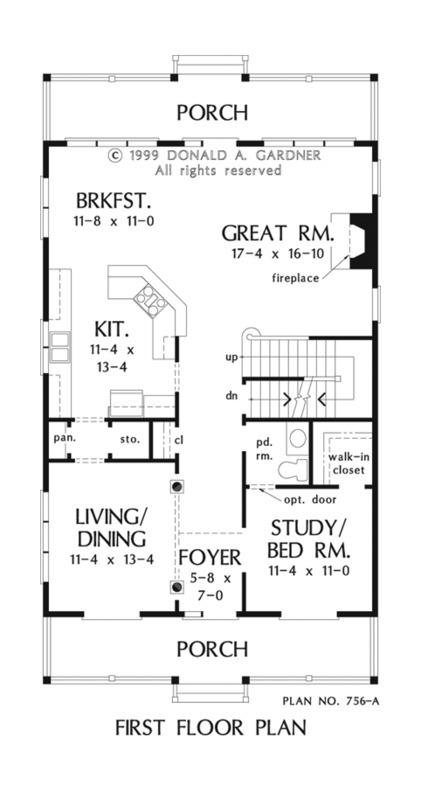 Ft.
1st Floor: 1170 Sq. Ft.
House Dimensions: 30' 0" x 51' 0"
Great Room: 17' 4" x 16' 10"
Master Bedroom: 13' 8" x 17' 0"
Foyer (2 Story): 5' 8" x 7' 0" x 18' 1"
Great Room : 17' 4" x 16' 10" x 9' 0"
Kitchen : 11' 4" x 13' 4" x 9' 0"
Utility Room : 5' 8" x 6' 0" x 9' 0"
Master Bedroom (Tray): 13' 8" x 17' 0" x 9' 6"
Bedroom / Study : 11' 4" x 11' 0" x 9' 0"
Bedroom #4 : 12' 8" x 11' 8" x 8' 0"
Porch - Front : 30' 0" x 6' 0" x 0' 0"
Porch - Rear : 30' 0" x 6' 0" x 0' 0"
Living Room : 11' 4" x 13' 4" x 9' 0"